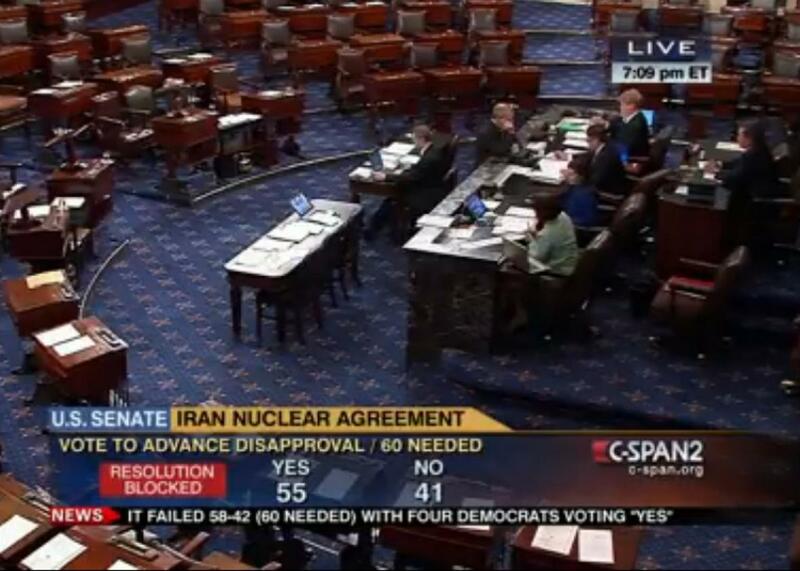 Senate Iran deal revote: GOP fails second try to advance disapproval of nuclear agreement. A riveting action shot of a failed cloture vote in the United States Senate. Senate Republicans failed for the second time Tuesday night to advance a measure disapproving of the Iran nuclear agreement. The resolution up for debate hadn’t changed at all from the previous Thursday, when the deal’s naysayers pulled together 58 of the 60 votes they’d need. They fell down to 56 on Tuesday: Presidential hopefuls Lindsey Graham of South Carolina and Rand Paul of Kentucky, scheduled to appear in separate debates Wednesday in California, missed the vote. Opposition to the Iran nuclear deal might be popular among American conservatives and especially the GOP presidential primary contenders (Paul and Graham’s skipping out on this critically symbolic vote notwithstanding), but the agreement has picked up one high-profile supporter who’s about to hit the trail in the U.S. himself: Pope Francis.